Since the announcement of her passing, memorial services continue across the virtual galaxy. It's a sad week for Star Wars fans. Following the tragic announcement that Carrie Fisher passed away yesterday, thousands of Star Wars: The Old Republic players gathered to pay their respects and memorialize her life. All across the galaxy, players made the pilgrimage to House Organa on Alderaan, the ancestral home of Fisher's character in Star Wars, Princess Leia. What started as an impromptu gathering transformed into memorial services of hundreds on each server, lasting hours as players danced and lit fireworks to celebrate her life. While each of The Old Republic's server communities are grieving in their own way, it's touching to see how many took time out of their playing to journey to Alderaan. In order to keep servers stable, The Old Republic divides players into 'instances' when too many are in the same place at one time. 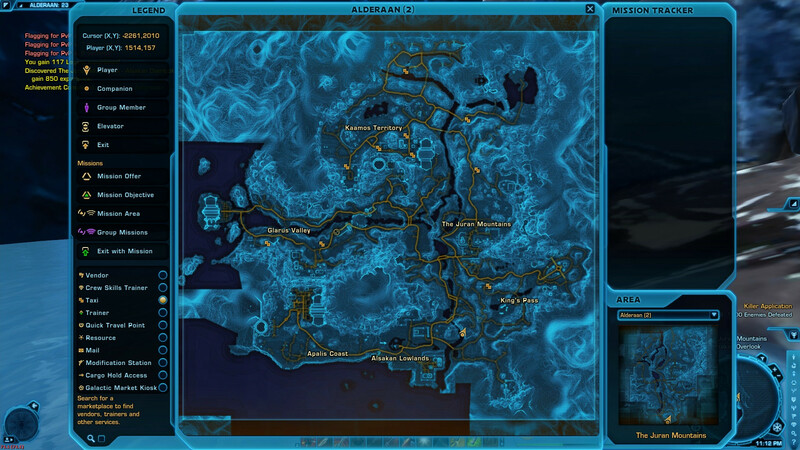 On most servers, Alderaan was up to almost ten instances, each brimming with about a hundred players. On one server, a player even went so far as to create a new character in the likeness of Leia, so that others could say their final goodbyes in person. In a video captured by player Kerry Nobbs, players are seen bowing in silence to Leia and then, later, raising their lightsabers. Meanwhile, The Old Republic subreddit and official forums are filling up with tributes and images capturing the ceremonies as players express their grief. Even those on the dark side of the force set aside their disputes to honor her. House Organa, being a member of the Galactic Republic, is at war with the Sith Empire and their various agents. That means that players belonging to the Sith Empire who travel to the estate will be met with a sizeable army of battle droids and guards, yet that couldn't stop them from devising a way to attend the ceremonies. Across many servers, high-level empire players distracted the Organa guards in combat so that their lower-level peers could enter House Organa and join the memorial. Amazingly, I haven't seen any accounts of players killing one another either—which has been a long-standing and despicable tradition during in-game funerals in some MMOs. "We had to trash a few droids that didn't show the proper respect, but we were otherwise as polite as anyone else there," wrote 'ValidAvailable' on Reddit. "She stood against two of the greatest Sith ever and lived to tell the tale; the Empire can respect that." Where imperial players weren't able to organize escorts, others like Darth Benthamic had to use force powers and risk their lives to slip past the guards undetected. He documented his journey in an Imgur album which you can see here. "It was touching to see that heroes from both sides have united to pay respects to such an inspiring and charismatic figure," he wrote. On the official forums, players have also started a petition asking that developer BioWare memorialize Fisher by adding a statue at her family's residence. Obviously that's a bit tricky considering The Old Republic takes place thousands of years before Leia was born, but it's a wonderful gesture anyway. While Fisher is famous for her role as Leia, more recently she was also well known for her frank discussions about her struggles with addiction and mental illness. During a gathering on the Ebon Hawk server, players spoke fondly about how Fisher's honesty helped them deal with struggles of their own. "Her speaking candidly about mental illness helped me come to terms with my own," wrote Yela'la. "She turned what many see as a flaw into a source of inspiration… not always perfectly, but always honestly," wrote Cyndar. If you want to travel to Alderaan to pay respects to Fisher personally, you can download Star Wars: The Old Republic and play for free. Alderaan is a planet designed for players around level 27, but if you play through the first hour or two and gain access to your ship, you'll be able to travel there—just avoid any of the monsters as they'll quickly kill you. House Organa is located just north of the Apalis Coast, just follow the road as it curves north-east. You should also play one of the Republic classes, so that you don't have to avoid the Organa guards.